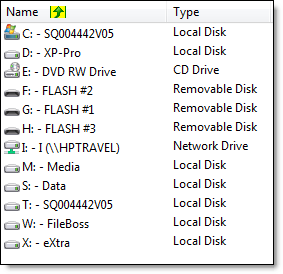 FileBoss can display drives in the main window in two ways either just showing the drive path, e.g. C:\ or with the volume names as shown in the two graphics below respectively. It can also display and sort drives by their sizes and used and free space. 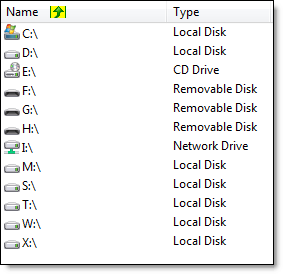 To change the way drives are displayed use the Edit > Program Options... command from the main menu. In the resulting dialog select the Views panel and then check or uncheck the Show Drive Names option as approriate. There are three possible settings in addition to None. 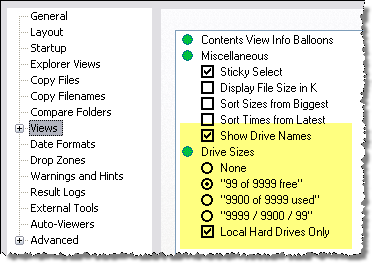 The last setting "9999 / 9900 / 99" displays the total size / size used / size free. 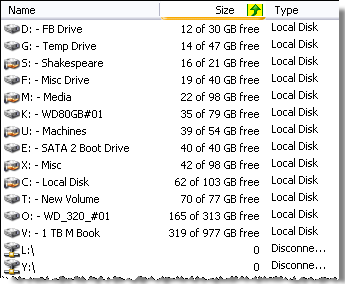 The following screen shot shows the drive sizes option set to show the free space and is sorted by the amount of free space available on each drive.